My friend Jenny came second in the Queensland Poetry Slam finals. The winner was Vivi Baker with her poem on The Murder of Women. I was unable to contact Ms Baker for her permission to publish her poem, that’s why this post is late, but Jenny Campbell gave me her poem to share. I hope you like it. Congratulations to both women poets who will now enter the Australian national finals. I wanted an image to go with Jenny’s poem and there was so many to choose from, but I thought this one was appropriate. It was one of the many Trump images on Digital Arts UK – following his election last year. 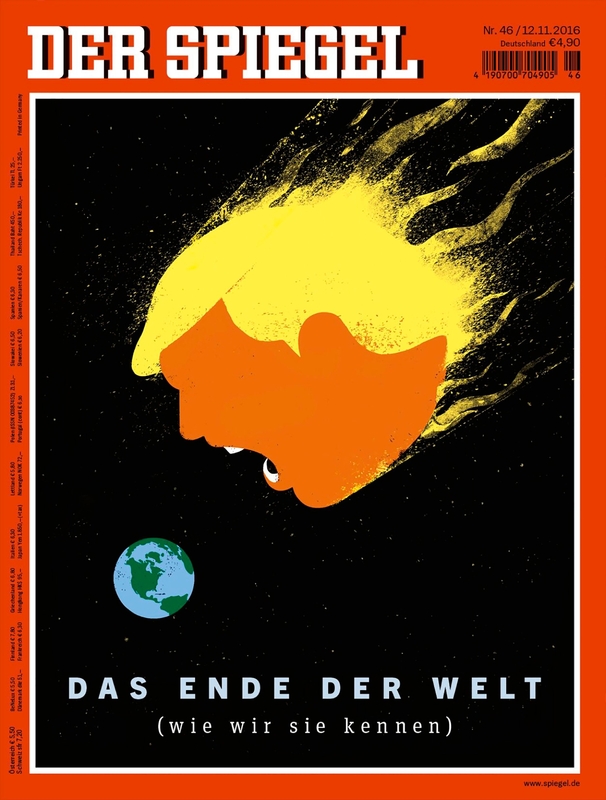 This was the cover for German publication Der Spiegel. Translation: The end of the world (as we know it). Published on Digital Arts UK. Anatomy of Terror – Jenny Campbell. it’s in our leaders guilty blink. the terror here and terror there? Invent a villain, Laissez Faire! may reveal a suspicious bard. Hide your children! Take the stairs! They come in ones and groups and pairs! they’re using terror as their oars! and who could guess where that came from? to help us fear them on command. “They” are world leaders, close the door. To sovereign coin they pimp and whore. but how they fear revolution’s name. delivering terror door to door. they ‘manage’ what we see and hear. indifferent to the lives they shed. be alarmed: they built this zoo!